Lynn Jaanz is an internationally acclaimed artist who’s received honourable mention at the 30th Annual Chelsea International Fine Art Competition at the Agora Gallery in New York and was awarded for her series at Spectrum Miami Exhibition. Featured in the Artist’s Palette Magazine and Melbourne Observer, Lynn has also appeared on Lethbridge Gallery’s website as a Lethbridge 10,000 finalist for her ‘Rapture’ painting. MANUKA magazines speaks to Lynn about her art, her inspiration and her healing. 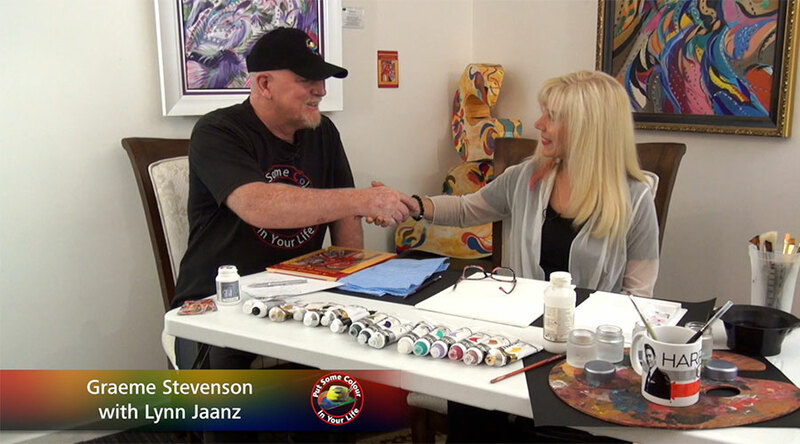 As an established and well-known prophetic artist, Lynn Jaanz’s colourful artwork is well sought-after between New York, Miami, Singapore, Milan, Rome, and Australia-wide. Lynn regularly exhibits around the world and has sold her works internationally for over a decade. Her masterworks are bought as statement pieces as part of interior design projects for luxurious homes, while others are commissioned and sold to investors and art collectors. After exhibiting at the Plural Unique 2 show at Next Gallery in Piacenza, Italy in late 2015, Lynn has built a strong following in Italy with recently exhibiting at RossoCinabro Gallery in Rome, Italy in May 2017. Born in Egypt and raised in Australia, art has always been part of Lynn’s life as she was surrounded by nature, beauty and artistic inspiration. Undoubtedly, this was a big reason why Lynn began to paint. However, after having travelled to Italy in the 80’s and seeing such inspiring paintings and beauty of the countryside, Lynn was left with vivid images in her mind. These visions have been interpreted and still appear through some of Lynn’s paintings. Lynn Jaanz’s art is appreciated for its unique and fresh approach to abstract, with its underlying interpretations of spirituality and perception of a higher power. Her work has the ability to touch one’s heart and soul as her art translates significant meaning and sovereignty straight from the canvas. Behind the joy of painting, Lynn spent years battling a chronic illness. Painting became a big part of her healing process as doctors instructed to use painting as a form of recovery. This condition drew Lynn to the world of the supernatural. Today, her work reflects the way she sees life with all of its colour and beauty. From rich warm hues to cool tones, Lynn searches the unknown phenomenon and psychic of the human condition and explores the complexities of living. She taps into a truly unique style of curves, with the use of colour in erratic, speedy, busy tumultuous ways. Through fine lines and outlines of curves, Lynn’s search of higher power in all his glory is what she is celebrated for. salvation. “Man is searching for meaning, searching for hope, searching for love, searching for significance in his perpetual state of confusion” says Lynn. Her art gives hope and rejoices the light in the dark. Described as an abstract colourist,Lynn Jaanz is renowned for representing the journey of life extensively as the topics of birth, death, heartache, sorrow, joy, love and eternity are depicted by the recurrent images of crosses and colours. Lynn’s use of extreme and strong colour, textures and imagery to reinforce the different stages of life and the emotional conditions that come with it. The commotion expressed in some works depicts the myriad of experiences and sentiments on the journey. With close observation, art lovers can identify the varied durations, dramatic and poignant strokes. Her freehand style displays life in its fullness. Through these techniques, Lynn takes aestheticians on a journey within each colour, with all its power, beauty and majesty. Her vision is to give art lovers a sense of joy and peace in a world that is so full of fear.